Separate crescent dough into 8 triangles. 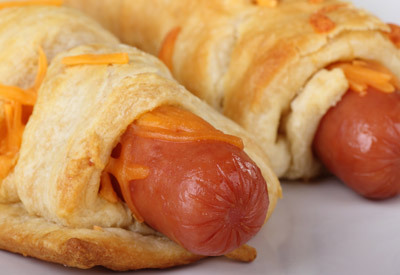 Place one hot dog and sprinkle 1/8 cup cheese onto each crescent roll. Wrap dough around each hot dog leaving ends exposed. Place on ungreased cookie sheet with the seam side down. Bake for 12 to 15 minutes or until golden brown. Serve with ketchup for dipping.